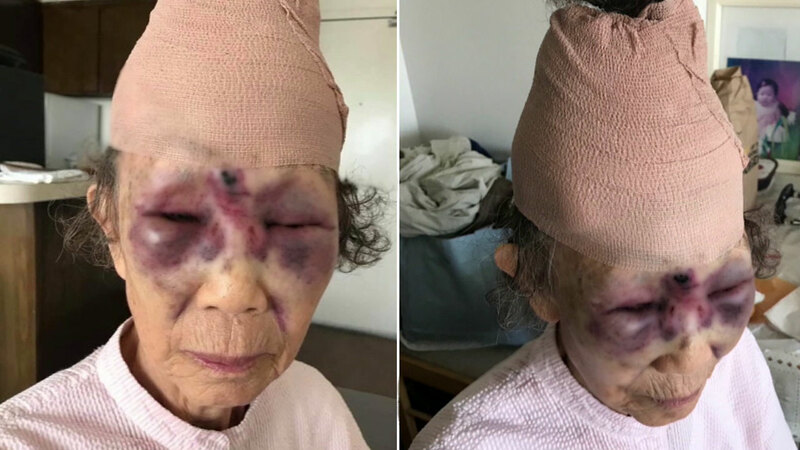 Two images show the injuries on an 85-year-old woman after she was attacked by a man in broad daylight in Koreatown on Saturday, Feb. 10, 2018. KOREATOWN, LOS ANGELES -- Los Angeles police are looking for a suspect in the violent attack of an 85-year-old woman in Koreatown. The elderly grandmother was walking on a busy street in broad daylight when a random person walking next to her hit her in the face with an open hand, according to the woman's granddaughter. The incident happened Saturday at about 1:30 p.m. near the Hannam Market at the corner of Olympic Boulevard and Vermont Avenue, police said. The grandmother said all she remembers is the man walking beside her and then hitting her before she woke up. The woman was taken to a nearby hospital with injuries to her face. Granddaughter Yujin Ko took a haunting photo of her grandmother's injuries. "Her eyes are black and blue, her forehead is black and blue," Ko said. "She got a lot of stitches on her scalp, so she's bandaged up." The tiny grandmother, who weighs just 90 pounds, took a brutal hit to the head. The suspect got away without a trace. "Luckily, a lot of people were there to help her, and so she said people were rushing to her, and I don't know if that's the time that guy got away," Ko added. "The paramedics came, the ambulance came, and the police came."